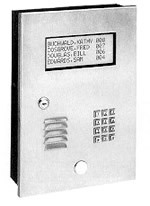 The following Tele-entry system can replace any existing out dated conventional intercom system without rewiring to the building. The original "no phone bill" building entry control system.It is distinct from other telephone entry systems in its ability to tie into a building's internal phone wiring, thereby bypassing monthly telephone charges. It also does not require tenants to pay for an individual phone line to operate the system and is not affected by interruptions in telephone company service. The Enterphone Axess is an incredibly economical telephone entry system for any building up to 1000 suites. 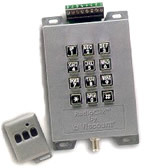 As an Enterphone® 2000 panel, the enclosure is called the Centurion. For the additional benefits and features of the Enterphone 2000 system please refer to the separate Enterphone 2000 brochure. The Enterphone Axess combines rugged design, heavy gauge steel construction and special epoxy coating to create a highly vandal resistant product. A fully sealed, weather-resistant panel makes the Enterphone Axess an excellent choice for a wide variety of interior and exterior applications. 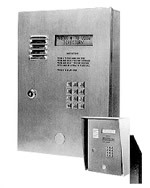 The Classic is Viscount's premium Enterphone® 2000 entry control panel for admitting guests to multi-family complexes. The Classic panel features oversized 1" keypad buttons to assist seniors and the handicapped in using the system. The separate directory kit includes Viscount's unique individual magnetic name strips to allow simple re-organization. The thin footprint of the Classic panel allows it to be surface mounted while projecting an almost flush mount appearance. The Slimline is Viscount's traditional Enterphone® 2000 panel for admitting guests to multi-family complexes. Viscount has been manufacturing Enterphone systems since 1964 and the Slimline panel was first released in 1966. This makes the Slimline the perfect panel to be used when upgrading older Enterphone I, Enterphone II, Enterphone MKIII, and Enterphone IIIS models. The Enterphone Crusader is Viscount's most rugged stainless steel telephone entry control panel for admitting guests to apartment buildings, commercial buildings and gated communities. The Crusader can be used as a dial up unit or as a panel for the more advanced Enterphone® 2000 "No Phone Bill" system. The Enterphone Marquis is Viscount's premium telephone entry control panel for admitting guests to apartment buildings, commercial buildings and gated communities. The Marquis can be used as a dial up unit or as a panel for the more advanced Enterphone® 2000 "No Phone Bill" system. The Enterphone Marquis EDU is a versatile, cost effective telephone entry system. 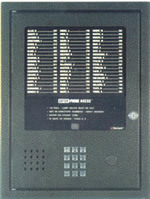 It has an extra large LCD directory that displays eight names and codes. The display can be read in direct sunlight or total darkness, without additional equipment, or expense. The Enterphone Marquis EDU can be used independently as a dialer or as a panel for the Enterphone® 2000 system. The Enterphone Elektra 2 is a versatile, cost effective telephone entry system. It has a built-in two line LCD directory that is easy to read in direct sunlight or at night, without additional options. The Enterphone Elektra 2 can be used independently as a dialer or as a panel for the Enterphone® 2000 system. Please refer to the separate brochure for the additional benefits of the Enterphone 2000. The Enterphone Elektra 4 is a versatile, cost effective telephone entry system. It has a large built-in four line LCD directory that is easy to read in direct sunlight or at night, without additional options.The Enterphone Elektra 4 can be used independently as a dialer or as a panel for the Enterphone® 2000 system. Please refer to the separate brochure for the additional benefits of the Enterphone 2000. The Enterphone Elektra 8 is a versatile, cost effective telephone entry system. It has an extra large LCD directory that displays eight names and codes. The display can be read in direct sunlight or total darkness, without additional equipment, or expense. The Enterphone Elektra 8 can be used independently as a dialer or as a panel for the Enterphone® 2000 system. Please refer to the separate brochure for the additional benefits of the Enterphone 2000. The Enterphone Elektra 48V is a versatile, cost effective telephone entry system. It has an integrated 48-name LCD directory with large characters that is easy to read in direct sunlight or at night. The Enterphone Elektra 48V can be used independently as a dialer or as a panel for the Enterphone® 2000 system. Please refer to the separate brochure for the additional benefits of the Enterphone 2000. The EnterChek access control system is a fully integrated system that provides control over building entry points, its interior locations, parking facilities and any other area that warrants EnterChek access control protection. It can operate as a stand-alone access control system or can be integrated with the Enterphone® 2000 building entry control system. The Enterphone Solo provides the latest in convenient door communications for any single residential or commercial intercom application. Security is in your hands with the RadioClik radio frequency access control system. RadioClik transmitters offer the convenience of traditional radio frequency openers but with the security of fully computerized access control systems. The miniature sized openers fit on any keychain to allow easy use without having to remove the keys from your car's ignition. Viscount's EnterTouch card access systems provide the ultimate in security and flexibility for any door control application. Using the system is easy. Simply touch your card against the stainless steel plate and the door releases instantly. There are no slots to be damaged or vandalized. The unit is weatherized to -40 F and is rugged enough to be used in any environment without the need for heaters or weather hoods. The EnterProx VP (Vandal Proof) card reader system from Viscount provides a perfect solution to any access control application where the convenience of proximity is desired yet plastic readers would be subject to theft or vandalism.